Yesterday was a bit slow I know, but today I have a bunch of stuff to show you! Let's dive right in! Winter Wonderland is absolutely stunning! There's something about silhouette images that I just cannot get enough of. I've also had a long time love affair with birch trees. We've included two different slender ones for you to build your beautiful birch tree forest. And the deers - we've got a mama/papa deer and the cutest little baby one. 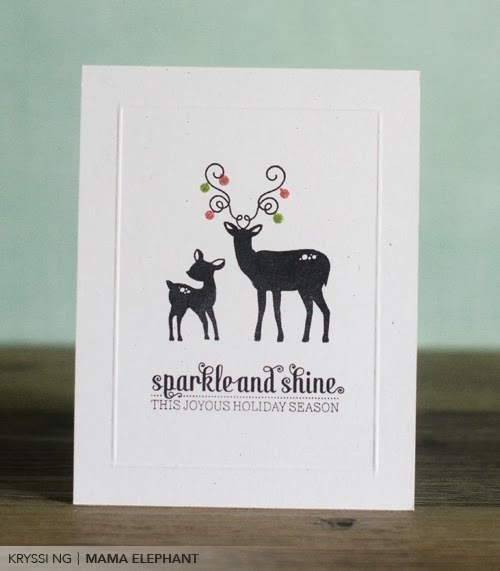 To make it festive, we've included a gorgeous antler for you to stamp on top of either deer. There are plenty of little stamps for you to decorate to your heart's content! This set is a fave among our designers, see for yourself! Winter Wonderland contains 21 stamps: 17 images and 4 sentiments. Approximate measurements: Birch Tree: 5-3/4" x 1/8" Sparkle and Shine: 2-1/2" x 3/5" Big Deer: 1-1/2" x 1-1/2" Moon: 3/5" x 3/5"
Next card I utilized the smaller stitched frame from our new Creative Cuts line -- Femme Frames. Isn't it perfect as a mat? So simple and understated yet with just the right amount of stitching detail. I took the dotted line from Party Kit to create my line. I stamped the star and tiny orament from Winter Wonderland using our fantastic new ink from our Creative Color line in Sunshine. It's such a bright yellow that it really pops and catches the eye! Here's another CAS card. 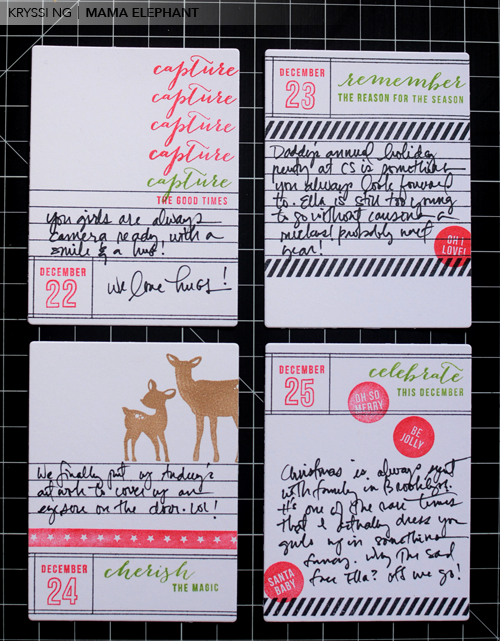 This time I stamped both deers in black and gave the mama deer the antlers. I decorated her antler with the tiny ornament. I also broke out my scoring board and scored a border. Pretty and simple huh? Might be a good idea for mass creating for the holidays for those pressed for time! Next up! 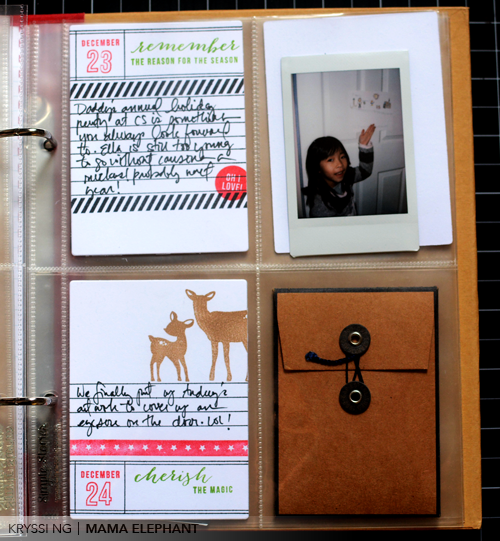 With documenting December so popular nowadays, we created a set that would be helpful in doing just that. Remember December is full of basic essentials that really is a staple if you do any kind of PL albums or scrapbooking. Remember December contains 29 stamps: Numbers 0-9, 15 words/sentiments and 4 images. Approximate measurements: Borders: 3-1/4" x 1/8" Circles: 3/5" x 3/5" Lines: 3-1/4" x 3/4"
I dug into my 2011 December pictures that I still haven't filed away. I had a cool advent pocket calendar system that year and it's still hanging on my door. Yup, almost 2 years untouched. Until now, lol! 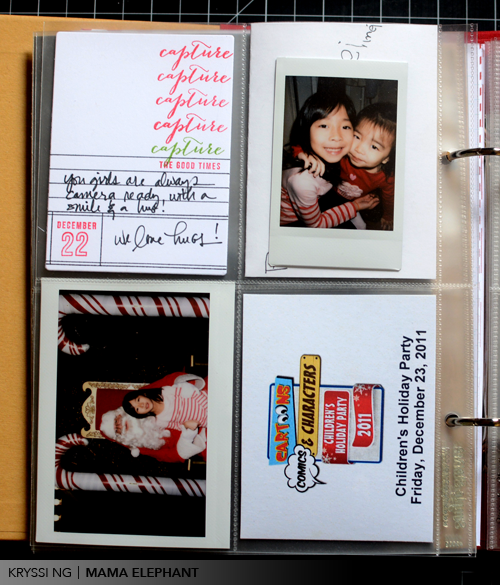 I created 4 simple 3x4 journaling cards to fit into my Snap album. The stamps work flawlessy with the 3x4 dimensions. Creative Colors used are Apple (not as bright as pictured), Hazel, and Mojito. Here are the cards inserted into the album. 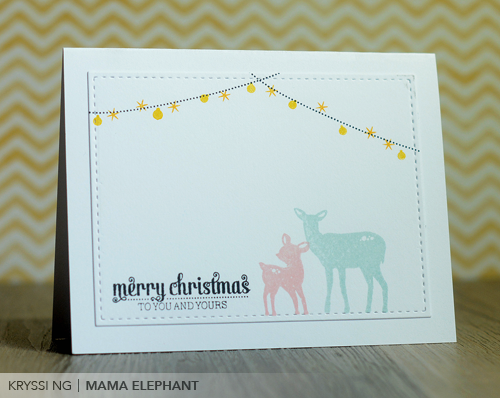 Today's last projects are featuring our Embellished Tag die set from our new Creative Cuts line. They are a joy to work with and really adds so much more to your crafting arsenal! The main tag measures 3.25" x 1 13/16". There is a stitched inner frame and it comes with 4 pattern building mini dies! They are my favorite part! You can choose to use the negatives or the positive die cuts to create some awesome patterns. Here's the first tag I couldn't wait to try. Can I just call this eye candy? Isn't it really? 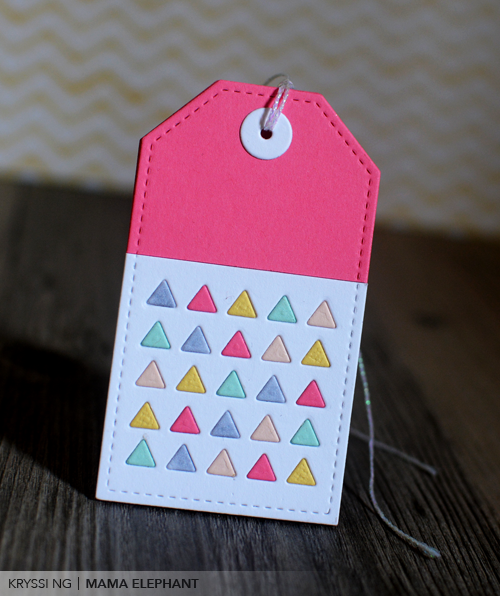 I die cut the main tag and then die cut the mini triangles directly on top of the tag. I did this 5 times to create this seamless pattern. 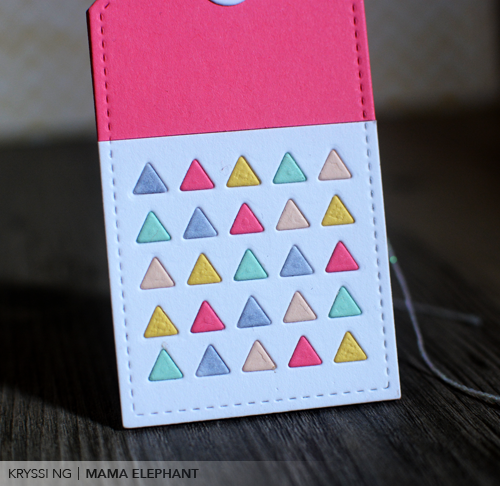 Then I die cut the triangles 5 times on colored cardstock and used the positives on top of the negative space. It has a flushed look this way, so neat and tidy! The tag was originally all white, but a certain 3 year old found it and cut into the top part. So, I had to cut that off and mount it on top of a pink tag. I'm all about making the most of accidents! Here's a closer look. Eye candy, I'm telling you. My next tag is super simple. I stamped the deer from Winter Wonderland. 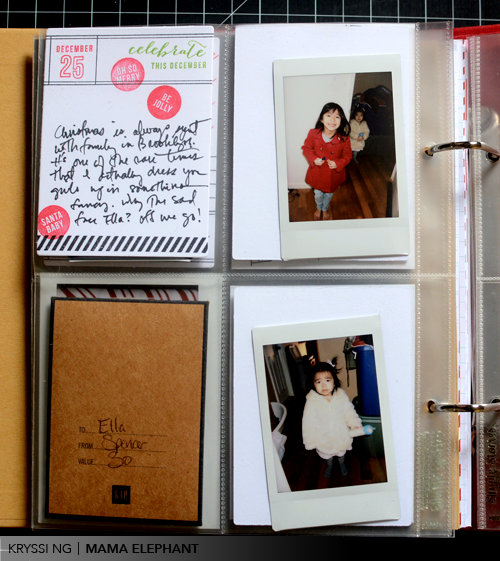 The journaling lines and Dec 25 are from Remember December. Simple and quick. Colored the deer in with clear glitter pen to give it a bit of a kick. 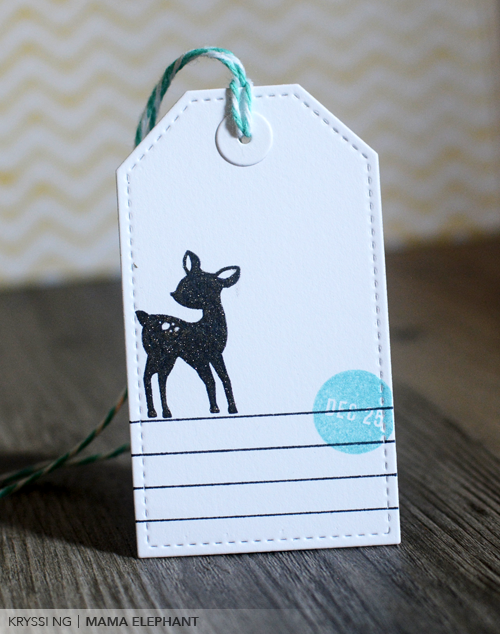 Finally, my last tag uses the tag stamp from No Peeking which we released last year. The tag was stamped with our new Apple ink. 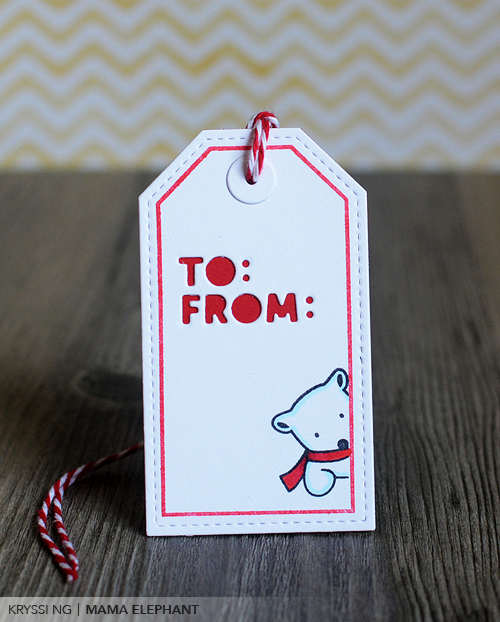 I also used the To: From: from this same set to cut out the negatives and then mounted on top of a red die cut tag. We made the tags coordinate to add more mileage to our designs. :) The polar bear is also from No Peeking. I outlined him with a light blue Copic marker to give him some dimension. What do you think? Embellished Tag has way too many possibilities, agree? I love. And this concludes my longest post ever. See you tomorrow! I love everything!!! Those deer are so cute, love the spots on the back, really great detail. I'm really excited to see more of Remember December!! And those tags are so cute!! I must confess I don't make too many crafty things for the holidays besides cards for OWH...BUT I think this year I will have to so I can use your incredibly designed images!!! Man, these cards and tags are so gorgeous, they make me insecure about my lack of skills! Seriously, SO pretty, I am loving the deer and the light strands you created. Absolutely amazing projects and products! The deer are darling, Remember December clever and the tags way, way too cute! Delightful showcase! All of this is eye candy! I love every single thing! Sooo cute and clean, which happens to be one of my fav looks. Oh my goodness! I love every single thing! I need those deer in my life! And the tags... and the Remember December... and the ink... everything is AWESOME! Great job, Mama Elephant girls! SO much eye candy today!! The new stamp sets are awesome, love the deer and birch trees!! And how fun are those tags?!! Such happy colors, looks like a sprinkled cupcake!! Yummy! I love the Creative Cuts products - please keep them coming!! 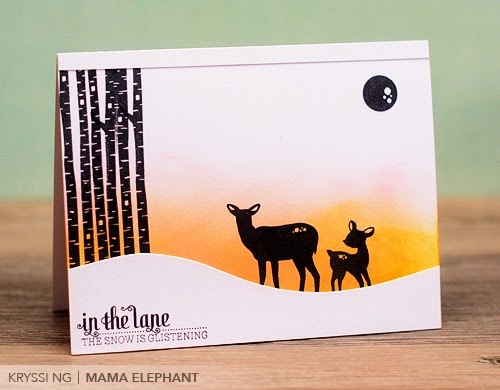 Love the silhouettes and winter landscape card! OH I am really feeling like Oct 15 is so FAR away... cannot wait to shop for new toys. AWWWW! I LOVE deer & birch trees in silhouette! This set is a MUST have for me! I mean...there is just so much amazingness here!!! Wow!! Those birch trees are swoon worthy!!!! An those little deer, eek!!!! Love them!!! The tags are gorgeous and I love how you also showcased some of te new inks!!! Are the Christmas sentiments on the birch tree set? They are BEAUTIFUL!!! Boy, you certainly were busy...all the projects are terrific but, gotta say, I'm a sucker for deer. Put them anywhare on a project and I'm immediately drawn to whatever it is. Those stitched tags drew me, too. You're right about the eye candy and those cute "To/From" diecuts. You can tell that there has been a lot of thought and planning with this release already - excited but anxious ( for my wallet) HA! I absolutely love every project you created today and want every single product showcased. I believe this is my favorite post of all time! Oh my gosh, everything is just adorable & fab! I can't wait to use these dies, love it all! I'm so happy that I held off on buying Christmas stamps...was patiently waiting to see what you'd turn out. All I have to say is wow! I want everything...as always. Absolutely stunning projects! Thank you so much for sharing them with us!